I researched some photobook printing companies and ultimately chose Artscow, because their prices were very reasonable. I knew the shipping would take a while (2 weeks), since they ship from Hong Kong, but I wasn't worried because I did this in October and had plenty of time. I found the page specs for their 8x8 39-page book at their website. Then I decided on a format for the cover and inside pages, and created templates for them. I also chose three related digital scrapbooking kits by Paislee Press, so that the book would have a cohesive look. The three kits are Twiggy Berry, Twiggy Lime, and Twiggy Guava, all available at Oscraps. I had purchased these a few months ago and I was excited to finally be able to use them. I also used some of the graphics from Cupcake Sweet Shoppe at Lettering Delights. Oh and the digital cardstock that I used for the actual recipe background is Plain Jane Cardstock by Laurie Ann @ Scrap Artist. I knew the book would start with a right-hand page, so I decided to make a "Intro/Table of Contents" page. 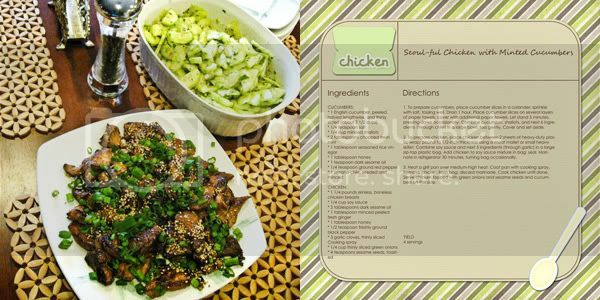 Then each recipe in the book would have a big 8x8 photo (cropped 8x8 at 300 dpi) on the left side and a recipe page on the right side. A closer look at the pages digitally. Left and right sides together. We personalized the book further by having some "Notes from Todd" on some recipes, where Todd shared what worked best in the recipe. I ordered the books on 10/4/09 and received them from Hong Kong on 10/29/09. If you order from them, you need to allow a long lead time. But like I said, the prices were very reasonable and I had time to wait. The print color was pretty good, but inconsistent. The colors actually varied from book to book. One book had great colors, while another one had a yellow cast on every page. Artscow don't do color correction on photobooks, so you don't have to manually turn them off. The pages are slightly thinner than Shutterfly, but still very nice and nothing to get concerned about. If you would like to see my whole book, you can go here. 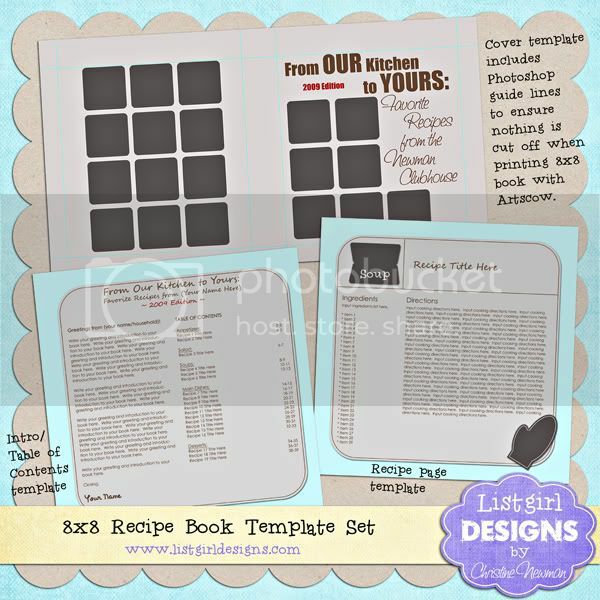 Since you read through my whole big post about our recipe book, I figured I'd give away the template set that I created. Just a note about the front and back cover template. I designed them to Artscow's specifications, so it might look different if you decide to print your book elsewhere. The front, spine, and back covers are all one template. You will need to crop them in Photoshop prior to saving the individual jpegs to upload to Artscow. 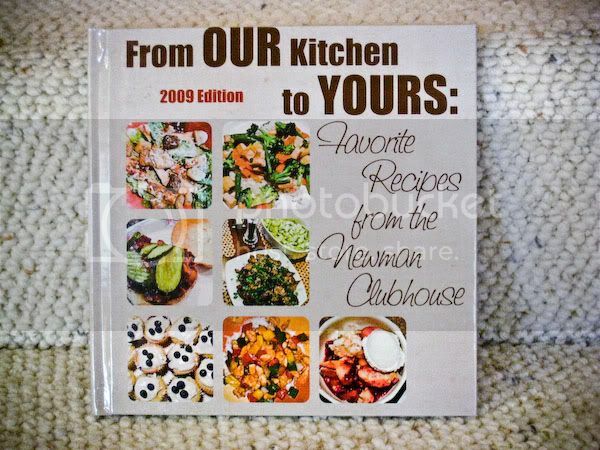 The Intro/Table of Contents page and the recipe page templates are just 8x8 (2400 pixels by 2400 pixels), so they should work with any 8x8 book printing company. As an extra bonus... I have five codes for free 20-page 8x8 Artscow photobooks. You would still have to pay the shipping yourself. They expire on 1/23/10, so you would need to use them pretty fast. If you're interested in them, comment in this post and I will pick five people randomly to receive the codes. Comments will close on Thursday 1/14 at 9pm Pacific Time. That book is AWESOME! LOL I'd order one of yours vs. making my own! LOL Great job! That's one of the reasons I came here a lot last year was for the food pics! heehee WONDERFUL JOB and THANK YOU for the templates! The book turned out so awesome! What a wonderful gift for your family! Thank you so much for the templates and thanks for the chance to win! Oh Christine, you rock. Seriously. Thanks for the review of ArtsCow. I've been a subscriber to them for over a year, but never ordered anything from them b/c of the unknown factor. So, I'm thinking they'd be a great place to order the kid's 8x8 copy of our Disney album. Sweet. this is such a cool idea christine!! i would love to sign up for teh codes too. i will whip up the baby book i have been dreaming about. Wow! This is too cool and what a great idea Christine! 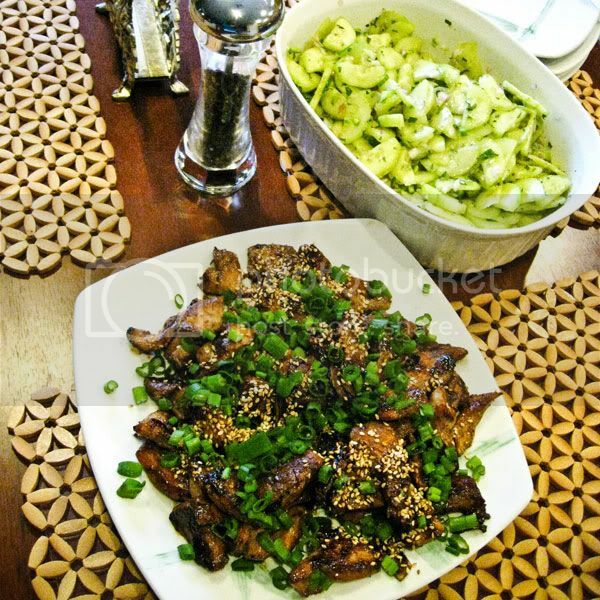 I would luv to put together a book of family recipes! (This is now my 2010 project!) Please count me in on the drawing! The book really does look amazing! I have thought about doing this so often! Thanks for the templates and the chance to get a book! You are so incredibly talented and oh so generous! Thanks so much! I always smile while reading your posts. Thanks so much for sharing the templates and all the other templates you've posted! I've heard mixed reviews about this site, but I'm certainly willing to give them a try. Thanks for a chance to win a code too. I made a book for my nephew when he turned one of his first birthday party and my sister loved it! This turned out amazing Christine!! And like some have mentioned I am tempted to buy yours instead of doing my own! Lol. What an awesome personal gift and so sweet of you to share!! Thanks for the templates! Love it! Pick me! What a cool project, Christine! This is wonderful, thank you so much for sharing your talent! This is fabulous! Thanks for the template! This is so cool. Thanks so much for the templates. I can't wait to put together a book myself. I have been meaning to try out Artscow, also. Thanks again for your generosity. Thanks for the templates Christine! 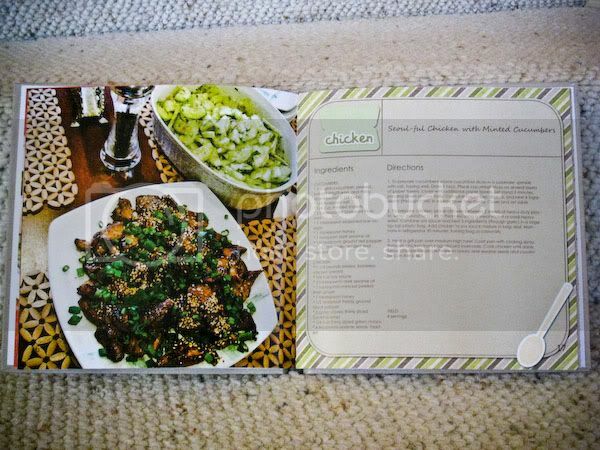 And your book turned out awesome, and I'm drooling over all the yummy food too! Merci beaucoup pour les templates!!! Thank you so much for the chance to win this! I would love to do a book! I love how yours turned out, so neat! I use Artscow for all my books! I love them and their prices (that being said, do not sign me up for a free one, I don't have any ready & since I order so much, I get free ones fairly often). 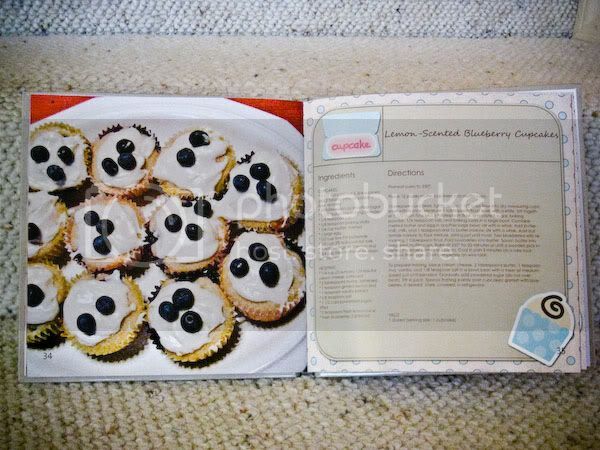 These recipes books are fabulous & I am so gonna try to make some next year for presents. I love the idea! ooooo...I love your cookbook! Y'all are very creative with your gift giving. Thanks for the template set..you are so good to us! Beautiful. I just love it. You made cooking look easy. Thanks for sharing the template. You are awesome! we actually started taking pics of our recipes on 1/1/10 so this would be PERFECTION!!!! This is SO awesome Christine! Thanks so much for sharing! That book is so neat. I'd like to try some of your recipes. You should give the book away!!! Thanks for the templates and the chance to win. 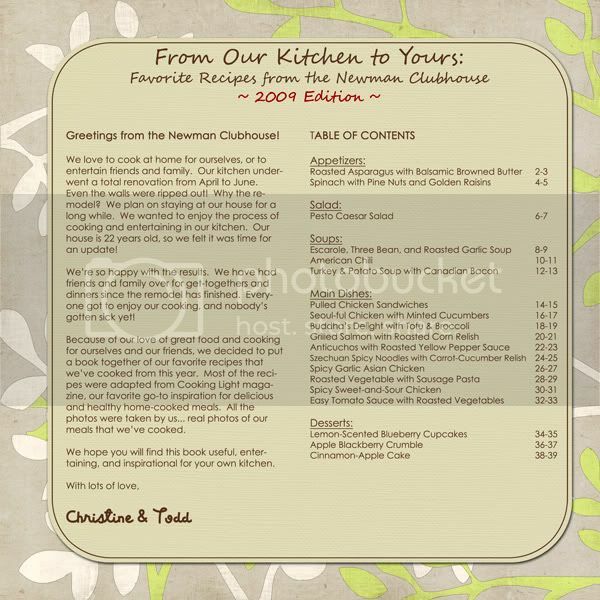 I am so excited that you're sharing the recipe book template. Thank you so much! I just LOVE the way yours turned out. Too bad I don't have any pages scrapped or I'd ask you to include me in the running for a free photobook. THanks so much for this - what a unique gift! 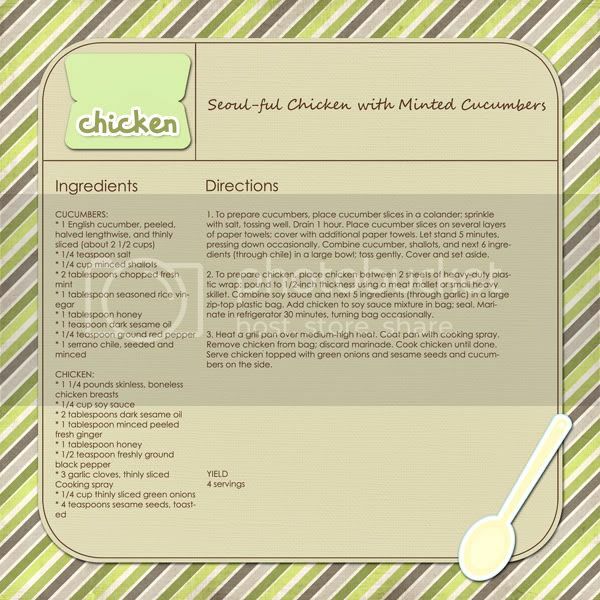 :) I have posted the freebie on my newest blog post. Thanks again! thanks for sharing! i've been meaning to do this for a long time, now with the template maybe i'll finally get around to it! Wow! Are you still waiting to give away the codes? I'm in! I'm such a fan! New Products + Freebie Template!